If you want to only climb one mountain in China, then let it be Huangshan Mountain. Its craggy rock faces, hanging mists and clustered pines are a distinctly Chinese landscape. The mountain range, consisting of some 70 peaks over 1,000 meters, winds across Anhui Province. Known as Yishan in ancient texts, the mountain range took on its present name during the Tang Dynasty (618-907 AD), most likely in honor of Huang Di, the father of the Chinese people in legend. Over time, its trails have come to be furnished with stone stairways. At the very beginning, during the policy of opening up, former Chairman Deng Xiaoping climbed the mountain and said, "Huangshan is a good place where tourism can prosper. You must boast about it and make it known to the world." The mountain entered a new chapter of development shortly after. 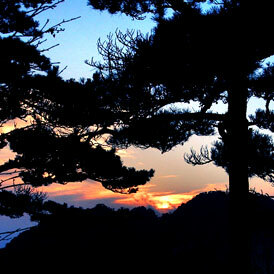 Huangshan was named a UNESCO World Heritage Site in 1999.